SALES & MARKETING Ashley Monroe You’ve come to the right place. Since 1943 Grain Processing Corporation has supplied the beverage industry consistent, high-purity grain neutral spirits. And of course we offer a full complement of sensory, analytical and customer service to back up every order. You can rely on GPC for quality and value with delivery that’s on time and hassle-free. General Inquiries (509) 944-5919 Advertising (509) 991-8112 PO Box 31494, Spokane, WA 99223 All contents © 2019. No portion of this magazine may be reproduced without the written consent of the publisher. 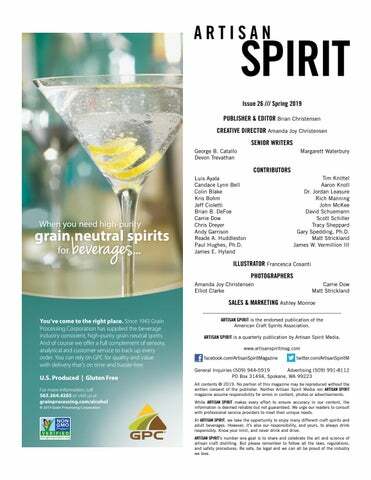 Neither Artisan Spirit Media nor ARTISAN SPIRIT magazine assume responsibility for errors in content, photos or advertisements. While ARTISAN SPIRIT makes every effort to ensure accuracy in our content, the information is deemed reliable but not guaranteed. We urge our readers to consult with professional service providers to meet their unique needs. At ARTISAN SPIRIT, we take the opportunity to enjoy many different craft spirits and adult beverages. However, it’s also our responsibility, and yours, to always drink responsibly. Know your limit, and never drink and drive. 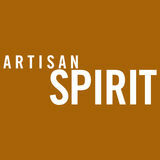 ARTISAN SPIRIT’s number one goal is to share and celebrate the art and science of artisan craft distilling. But please remember to follow all the laws, regulations, and safety procedures. Be safe, be legal and we can all be proud of the industry we love.